A car shipping company, like ourselves, is tasked with the great responsibility of transporting all types of vehicles from one part of the country to another. Our customers rely on and trust in our expertise and knowledge to get their cars to their destination in a safe and timely manner. Although many people use auto transport services when moving to a new home, this is not the only reason why people select to ship their car. If you are searching for a reliable and affordable way to get your vehicle from Point A to Point B, then an auto transport company can help. Many corporations, military personnel, vacationers, retirees, construction teams, and more utilize car shipping services. Shipping cars is what we do, but how exactly do you go about shipping a car? If this is your first time transporting a car, it may seem like a daunting and complicated process. On the contrary, car shipping is quite easy. Below, you will find an outline of how the entire car shipping process works, from start to finish. When booking auto transport services, it is important to make arrangements in advance. This ensures that you get all the services you want and need. Cleaning the exterior is not necessary prior to transport, but cleaning the interior is. It is required that you remove all personal items from the inside of the vehicle before shipping. Transport carriers must adhere to strict weight requirements. Therefore, not complying with this rule could lead to delays or fees. Although a formal inspection will be completed by the driver upon arrival, you may also want to conduct one of your own. This inspection is a walk-around of the vehicle, making note of any existing damage, such as paint chips, dents, and scratches. You may even want to take some photographs for your records if something were to happen during transport. There are several things that must be done to prepare your car for auto transport. One primary thing to keep in mind is in regards to fuel. It is recommended that you keep one-quarter tank of gas in your car. More than that is not necessary, as the car will only be driven on and off the transport carrier. Prior to transport, you must sign a contract, termed the Bill of Lading. This outlines the formal agreement between you and the transport company. Read over all documents before signing, and ask questions. Your car will be loaded onto either an open or enclosed transport carrier, whichever you chose during booking. Both are reliable and safe options when it comes to getting your car where it needs to go. Your car will make its way across the states. The Department of Transportation has set in place limitations on how many miles drivers can travel each day. This is for safety purposes. We will keep you updated with when you can expect delivery. With door-to-door auto shipping, the driver will drop your car off directly at your home or place of business. This eliminates the need to drive to a terminal, making car shipping easier and more convenient. 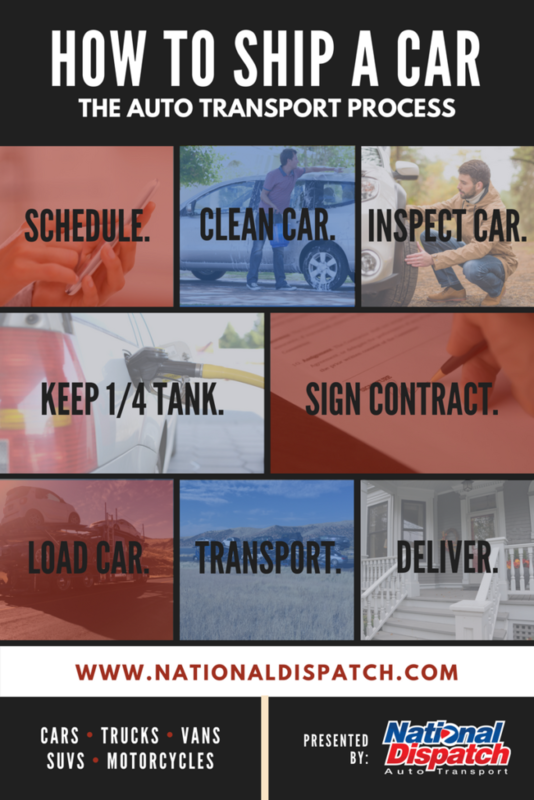 National Dispatch is a nationwide car shipping company and a leading provider in the industry. If you need auto transport services, contact us for a free, instant car transport rate. You can either use our online quote form, found on our website, or call us at 800-321-2051 to speak with an agent.